This is a bridal show you are not going to want to miss! Not only will there be tons of prizes and over 40 of the regions best wedding professionals, RANDY FENOLI will be the guest speaker after the electrifying wedding fashion show. 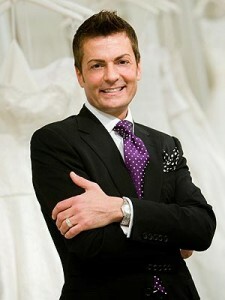 If you have not heard of Randy Fenoli, he is the Star of TLC’s “Say Yes To The Dress” television show. The Kingston Bridal Expo is taking place on Friday May 13, 2011 at the Ban Righ Hall Queens University (10 Bader Lane, Kingston, ON). Doors open at 430 pm and the fashion show begin at 8pm. Randy hits the stage after the fashion show and a meet and greet will follow! To buy tickets to this special wedding show visit their website at www.trademarkshowproductions.ca or stop by the The Bay Cosmetics or Gift Registry Counters. The fashion show is beautiful gowns are provided by Lilly’s Bridal & Special Ocassions Wear (824 Palaca Rd. Napanee ON).